It has been a busy time for tax-related news and upcoming changes. We have compiled many of the tax changes, deductions and tax rates for easy reference year round. It is more important than ever to plan ahead and review your options to maximize your financial results. Also please visit our side-by-side comparison of 2017 tax law and and the recently enacted "Tax Cuts and Jobs Act." Congress in December of 2017 passed the Tax Cuts and Jobs Act that made sweeping changes to the tax laws. The issues impacting individuals and small businesses are included throughout this pocket tax guide. The following are changes not covered elsewhere in the guide. Medical – The Tax Act retains the medical expense deduction and returns the deduction floor to 7.5% for 2017 and 2018, after which it returns to 10%. Taxes – This was a big bone of contention as the Act was being written, with the deduction originally totally eliminated. But that brought push back from taxpayers residing in states with state and local income tax, which can be pretty substantial, especially in states like CA, NJ and NY. In the end, property tax, state and local income tax, or in some cases sales tax, are still deductible. BUT, the deduction is limited to $10,000 per year. Home Mortgage Interest – Home mortgage interest took a big hit. For home acquisition debt incurred prior to December 15, 2017, taxpayers can still deduct interest on up to $1 Million of acquisition debt on 1st and 2nd homes. For mortgages acquired December 15 and later, interest will only be deductible on a maximum of $750,000 of acquisition debt on 1st and 2nd homes. However, the interest on up to $100,000 of equity debt will no longer be deductible beginning in 2018 regardless of when the debt was incurred. Charitable Contributions – Charitable contributions are still deductible as always, but the cap limiting total contribution deductions to 50% of AGI was increased to 60%, allowing a slightly larger deduction in some cases. Miscellaneous Deductions Subject to the 2% of AGI Floor – One category of miscellaneous itemized deductions has only been deductible to the extent the expenses exceed 2% of the taxpayer’s AGI. This category included employee business expenses, legal fees and investment expenses. This entire category is no longer deductible after 2017. Casualty Losses - Personal casualty losses will not be allowed except for those in federally declared disaster areas. Personal casualty gains in excess of personal casualty losses will be treated as capital gains and all such losses as capital losses. Moving Expense Deduction - After 2017, moving expenses and non-taxable employer reimbursement are suspended through 2025. However, the current treatment for moving expenses is allowed to continue for members of the Armed Forces on active duty who move pursuant to a military order. Child & Dependent Tax Credits - The child tax credit increases in 2018 to $2,000 (up from $1,000) with up to $1,400 being refundable. The earned income threshold is reduced to $2,500 (down from $3,000 in 2017) allowing more taxpayers to qualify for the credit. A child must be under the age of 17 and have a Social Security number issued before the return due date to qualify for credit. In addition a non-refundable tax credit of $500 is available for each non-child dependent that does not qualify for the child tax credit. The AGI thresholds at which the credit begins to phase out are substantially increased: to $400,000 for married filing jointly and $200,000 for all other taxpayers, up from $110,000 for married joint, $55,000 for married separate and $75,000 for all others. Discharge of Student Loan Indebtedness – Current law excludes from income the discharge of debt where the discharge was contingent on the student working a specific period of time in certain professions and for certain employers. This provision is modified to also exclude income from the discharge of indebtedness due to death or permanent disability of the student. Alimony - For divorce agreements entered into after December 31, 2018, alimony won’t be deductible by the payer and won’t be income to the recipient. IRA Recharacterizing Rule – The Act repeals the special rule that allows IRA contributions to one type of IRA (either traditional or Roth) to be recharacterized as a contribution to the other type of IRA. Thus, for example, under the provision, a conversion contribution establishing a Roth IRA during a taxable year can no longer be recharacterized as a contribution to a traditional IRA (thereby unwinding the conversion). The provision is effective for taxable years beginning after December 31, 2017. Net Operating Loss – The Act eliminates the 2-year carryback, except for certain farm losses, after 2018. Beginning after December 31, 2017, the NOL deduction is limited to 80% of taxable income (determined without regard to the NOL deduction) for losses arising in taxable years beginning after December 31, 2017. Luxury Auto Limits for Business Autos – The Act increased the luxury auto depreciation deduction limits for the 1st, 2nd, 3rd and subsequent years with year 1 increased to $10,000 and year 2 to $16,000. Deduction for Pass-Through Income - Generally for tax years beginning after Dec. 31, 2017 and before Jan. 1, 2026, the Act adds new Code Sec. 199A, "Qualified Business Income," under which a non-corporate taxpayer, including a trust or estate, who has qualified business income (QBI) from a partnership, S corporation, or sole proprietorship is allowed a deduction for pass-through income for the purpose of computing the taxpayer’s income tax. An additional standard deduction of $1,300 is allowed for each married elderly (age 65 and over) or blind individual. If elderly and blind, the additional standard deduction is $2,600. Single individuals (elderly or blind) are allowed an additional standard deduction of $1,600. The requirement that higher-income taxpayers phase out their total itemized deductions when their AGI exceeds a specified threshold amount is suspended for 2018 through 2025. *Old age, survivor and disability insurance portion of social security tax. **Self-employed individuals are allowed to take an income tax deduction for 50% of the self-employment tax. EARNINGS TEST – SS benefits of an individual who is under the full retirement age (66) are reduced when earnings from working exceed: $17,040/yr. MAXIMUM RETIREMENT BENEFIT – The maximum retirement benefit for workers retiring in 2018 at age 66 (full retirement age): $2,788/mo. *Provisional income generally includes adjusted gross income plus nontaxable interest plus one-half of social security benefits. **If married filing separately and lived with spouse at any time during the year, 85% of SS benefits are taxed. Special rates (capital gain rates) apply to gains attributable to sale of capital assets held for more than a year. CAPITAL GAIN RATES: The Tax Cuts and Jobs Act altered the regular individual tax rates, which the capital gains rates were previously tied to. So the Act created a separate rate schedule for capital gains tax. The table below illustrates the CG tax rates by filing status and range of income within the filing status. The child’s earned income plus $350. Contributions must be made by the due date of the tax return, NOT including extensions. Contributions are NOT allowed upon reaching age 70.5 (however contributions to SEP IRAs are allowed after age 70.5). Contributions must be made by the due date of the tax return, NOT including extensions. Contributions ARE allowed after age 70.5 (must have earned income). (1) The $5,500 and $6,500 limits apply to the combined Traditional and Roth IRA contributions of the individual for the year. SE Defined Contribution Plans: Lesser of 25%(1) of compensation or $55,000. (1) Effectively 20% of net self-employment income. forfeiture allocations cannot exceed the lesser of 100% of compensation or $55,000. (4) Includes 5% owners and at employer’s election 20% of the top paid employees. Source: Collegeboard.org Note: College costs increased at a rate of about 3.5% over the prior period for both public and private institutions. Three tax plans are provided to save funds for a child’s education. Contributions to them are NOT tax deductible. The tax benefit is the account earnings that accrue tax deferred are free from tax if used for qualified education expenses. Coverdell Account – The annual contribution limit for 2018 is $2,000 per student. Funds can be used not only for higher education but also for Kindergarten through grade 12. Contributions must be made by the April due date for filing the return. The contribution limit is ratably reduced to zero for Joint filers with MAGI between $190K and $220K and $95K and $110K for others. Sec 529 Plan – The total contribution per student is only limited by the projected cost of the student’s planned education. The donor’s annual contribution is generally predicated on donor’s gift tax issues. Generally each donor can contribute up to the annual gift tax exclusion ($15,000 in 2018) per year without gift tax implications. In addition the exemption amount for the next four years (total $75,000 in 2018) can be contributed at one time (generally in the earlier years to benefit from increased earnings). Funds can only be used for post-secondary education, except the Tax Cuts & Jobs Act allows up to $10,000 per year to be used for elementary and high school education expenses beginning in 2018. Savings Bonds – A taxpayer who pays qualified higher education expenses with redemption proceeds from Series EE or I Bonds issued after 1989 may be able to exclude the bonds’ income. To qualify the bonds must have been purchased when the individual was at least age 24 and redeemed at the time of the education expense for the taxpayer, spouse, or dependent. 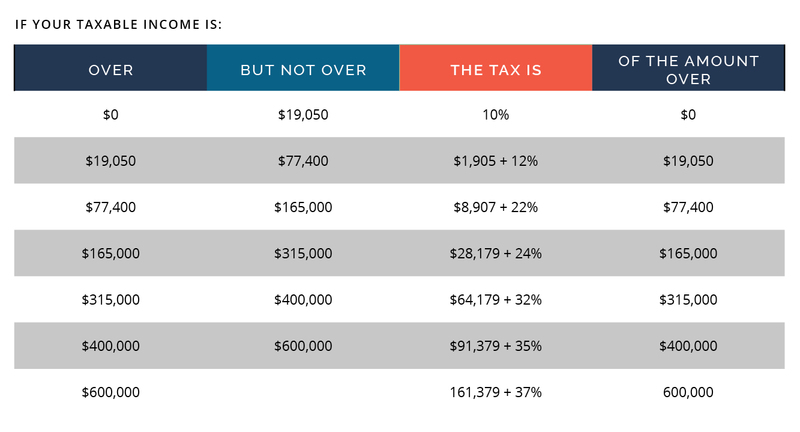 The income exclusion phases out for joint filers with a MAGI between $119,550 and $149,550 ($79,700 and $94,700 for others). The amounts shown are the $/mile during 2018. *Reflects rates in effect since 10/1/2017, using the simplified method of determination. The Tax Cuts & Jobs Act allows 100% unlimited expensing of tangible business assets (except structures) acquired after September 27, 2017 and through 2022. Applies when a taxpayer first uses the asset (can be new or used property). The addition of this provision eliminates the need for Sec 179 expensing until 2023. The Tax Cuts & Jobs Act established a flat corporate tax rate of 21% beginning in 2018. Each individual is allowed an annual gift tax exclusion of $15,000 per donee for 2018 (up from the $14,000 that has been in effect since 2013), with no limit to the number of donees. These gifts are not deductible by the giver nor are they taxable to the donee. Gifts in excess of the exclusion must be reported on a gift tax return. Gifts in excess of the exclusion are taxable but are offset with the Unified Estate and Gift Tax Credit until that credit is used up. Any amounts used to offset the gift tax will reduce the amount of credit available for the giver’s estate tax. * Married separate (MS) use 1/2 of the joint dollar amounts. The Tax Cuts & Jobs Act substantially increased both the AMT exemptions and the exemption phase out threshold which will substantially reduce the number of taxpayers affected by the AMT in 2018.
b. Otherwise, 100% of the prior year’s tax liability. *$75,000 for taxpayers filing married separate. Example: If you invest $10,000 at an interest rate of 6%, at the end of 30 years you will have $57,430 ($10,000 multiplied by 5.743). Example: If you put $1,000 at the end of each year in an investment paying 6% a year compounded annually, at the end of the 30th year, you will have $79,058 saved ($1,000 x 79.058). Assume a planned retirement age of 60. Based on average statistics, you will need to accumulate retirement assets by age 60 to last for 24.2 yrs. * Life expectancy rates based on the IRS Unisex Single Life Tables. 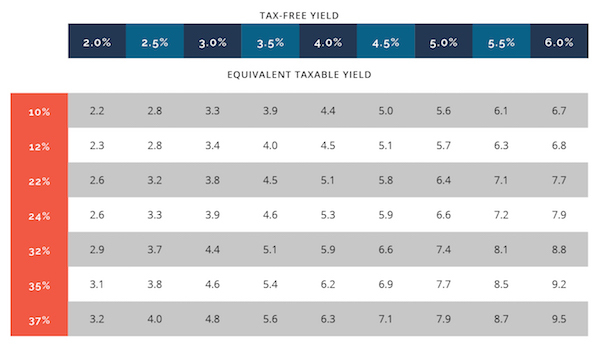 Example: A taxpayer in the 24% tax bracket would have to purchase a taxable investment yielding more than 3.3% to outperform a 2.5% tax-free investment. 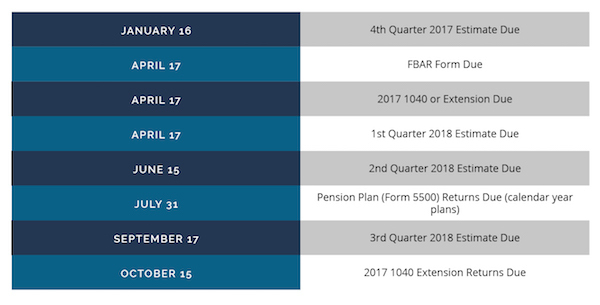 The information provided is an abbreviated summary of tax and financial information for the 2018 tax year and only includes law changes through December 2017. Pending or future tax legislation and regulations could alter contents of this brochure. The accuracy and completeness of this information is not guaranteed. Specific questions relating to your specific tax or financial situation should be directed to your tax and financial advisor.